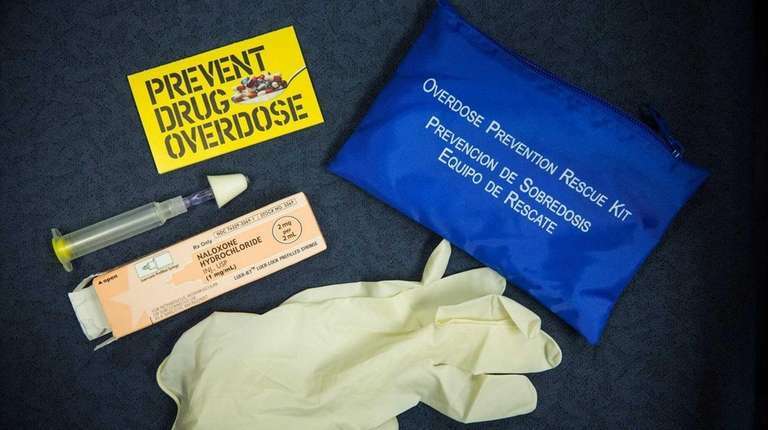 Naloxone — an antidote that reverses the effects of an opioid overdose — will be provided to anyone without a prescription at more than 700 New York City pharmacies, as part of a new initiative to reduce overdose deaths in the city, the health department announced Monday. The “Save a Life, Carry Naloxone” campaign is part of a $3 million public education effort intended to reduce deaths from unintentional overdoses, which have numbered 860 so far this year and hit 937 last year. Most of the funds for the campaign will be coming from the mental health initiative “Thrive NYC,” spearheaded by first lady Chirlane McCray. The campaign will include “Save a Life” ads on digital and social media, as well as local venues and the neighborhoods most affected by overdose deaths. The Staten Island Ferry terminals, nail and hair salons, and barbershops are all targeted for the ads. In April, Mayor Bill de Blasio announced he was doubling the number of naloxone kits distributed by the Health Department from 7,000 to 14,000. The city will also expand the availability of buprenorphine, a medication that stops opioid cravings and prevents withdrawal symptoms. “We are working hard to close treatment gaps so that New Yorkers get the help they need to live free of opioid misuse,” McCray said in a statement. Correction: An earlier version of this story stated that naloxone would be free at pharmacies. Though Naloxone will be available at more than 700 NYC pharmacies, it will not be free of charge.